A 51 years old woman was reffered to our dermatology clinic with one year history of numerous skin coloured papuels which gradually worsened with time.phiysical examination revealed that the papules were follicular with 1-2 mm diameter.some papules had dark black keratinous material on their surface, giving them a comedo like appearance (Fig. 1). The lesion were located in right lower quadrant of abdomen. The patients didn’t complain of any symptoms just pruritus before appearance of lesions.we performed elyptical biopsy of the lesions. 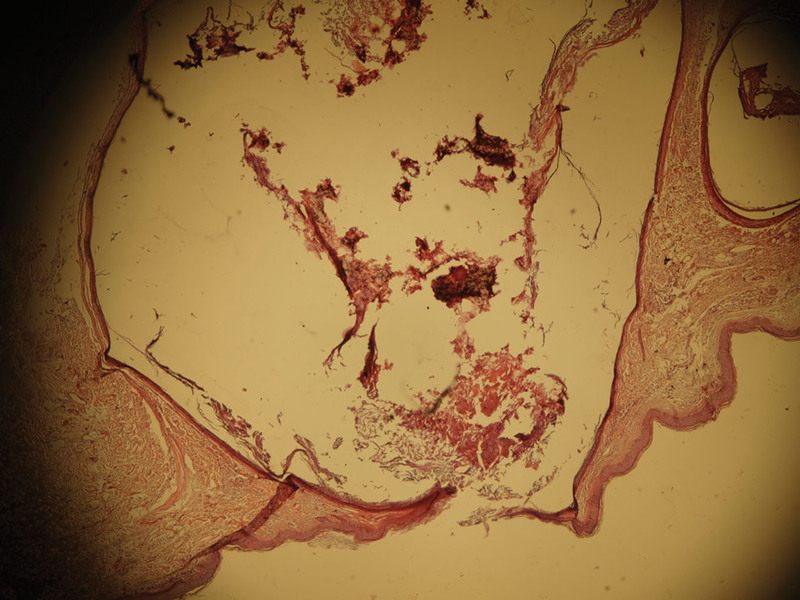 Histopathologic examination revealed dilated cystic structures filled with lamellar keratin,in accordance with the feature of nevus comedonicus (Fig. 2). The prevalence of nevus comedonicus has been estimated from 1 in 45,000 to 1 in 100,000, with no gender or racial preference. In 50% of patients, the condition develops shortly after birth and in the majority of patients lesions appear before the age of 10. Single cases of delayed development of nevus comedonicus at later age have been reporte . Asymptomatic lesions may be left untreated or therapy may be implemented for cosmetic concerns. Reported treatments include surgical excision, CO2 laser, dermabrasion, extraction, topical retinoic acid, topical tazarotene and calcipotriene and numerous topical keratolytics . In this case,we lost her for follow up. Figure 1. Closely arranged slightly elevated papules that have at their center keratinous plugs resembling comedones. Figure 2. Dilated cystic structures filied with lamellar keratin. 1. Tchernev G, Ananiev J, Semkova K, Dourmishev LA, Schönlebe J, Wollina U. Nevus comedonicus: an updated review. Dermatol Ther (Heidelb). 2013;3:33-40. 2. Deliduka SB, Kwong PC. Treatment of Nevus comedonicus with topical tazarotene and calcipotriene. J Drugs Dermatol. 2004;3:674- 6.